Divine Discourse on "God is the Indweller"
The entire universe is under the control of God. God is governed by Truth. Noble souls are the guardians of Truth. Such noble souls are verily the embodiments of Divinity. People undertake various spiritual practices to attain Divinity. One may be evil-minded, yet with the blessings of elders and in the company of noble souls, one can easily get rid of evil tendencies and develop virtues. The life of Ratnakara, the highway robber, bears ample testimony to this. His life was transformed as he came into contact with the Saptharishis (seven sages). He gave up his evil ways and unwaveringly followed their teachings and ultimately became the Sage Valmiki. [see: RRV-I, Ch. 1 & 15; RRV-II, Ch. 13 & 14] He set an ideal to mankind and composed the great epic Ramayana. Prahlada, the son of demon king Hiranyakasipu, constantly contemplated on Lord Narayana and chanted His Name. As a result, he had the same divine effulgence of Lord Narayana Himself. [The story of Prahlada can be found in Srimad Bhagavatam, Canto 7, Ch. 4 to 10] Likewise, Charles Darwin resembled his master Henslow in all respects as he continuously thought of him and followed his teachings. Similarly our ancient sages and seers always contemplated on God constantly and adhered to His dictates. As a consequence their faces radiated divine brilliance. Lord Krishna has said the same in the Bhagavad Gita, Mamaivamso jeevaloke jeevabhuta Sanathanah (the eternal Atma in all beings is a part of My Being). [See: Bhagavad Gîtâ of Order, Ch. 15, verse 7 for the complete Sanskrit verse and word for word translation] He said, "Arjuna, it is My Divine effulgence that shines forth in all." God is all-pervasive. He is present in all elements and in all beings in the form of radiance. When God is ever present within, why does man suffer? Some people say that they are facing hardships and are leading a miserable life. It is foolish on their part to say so. God, the indweller, has absolutely no sorrow and worries. He is the embodiment of supreme bliss. Is it not a sign of foolishness to think that you are haunted by misery when God is installed on the altar of your heart? God says, "I am present in you. You are but a spark of My Divinity." Such being the case, how can one be affected by difficulties and sorrows? When you enquire on these lines, you will realize that the demonic and bestial tendencies in you are responsible for this. You will not be able to experience the truth Matwivamsho ... unless and until you give up evil qualities. Though God is present within, man behaves as if he is under the influence of a demon. First of all, he should realize that he is a spark of divinity and that no evil spirits can control him. God says that He resides in your heart. Heart is a single seat. There is room for one only. So, God only should be seated in your heart and none else. Today man is failing to comprehend that he is an aspect of divinity. He is unaware of the fact that God is within and deludes himself that there is none to care for him. Everyone is endowed with a heart which is divine and by nature full of compassion. God dwells in such a heart. But today man has become hard-hearted as he has lost this natural compassion. Such a person cannot be called a spark of the Divine; he is verily a demon. The assertion Mamaivamsho ... does not apply in such case. There is a spark of divinity in the heart of everyone. It is because of bhrarna (delusion) that man is unable to realize his divine nature. In the first instance, man should make efforts to overcome this delusion and realize that God is always with him, in him, around him, above him and below him. Delusion causes evil feelings to arise in your heart and mind. They are sheer imagination have nothing to do with divinity. God is present in the heart of one and all. He does not have a particular form and is not confined to a particular place. He is present in your heart and is all pervasive. Sarvatah Panipadam Tat Sarvathokshi Siromukham, Sarvata Sruthimalloke Sarvamavruthya Thishthat (With hands, feet, eyes, heads, mouth and ears pervading everything, He permeates the entire universe). [See: Bhagavad Gîtâ of Order, Ch. 13, verse 14] Such effulgent divine principle of the Self is termed as Atma. Krishna has asserted, this Atma is a part of His own aspects. There cannot be any defects or imperfections in such divine principle. Whatever defects you think you see are purely the result of your imagination. God is the embodiment of virtues. Hence, man too should lead a life of virtues. Evil propensities are impediments to the spiritual path. For a start, man should distance himself from all evil actions and undertake good deeds. Only then will he have the right to call himself a human being. Human life is highly sacred. The Upanishads consider human life to be verily divine. Man considers himself to be a weakling because he has forgotten the principle of The Self which is beyond all attributes. His evil qualities, wicked deeds and misconduct have brought him down to this sorry state. As is his company, so are the thoughts. Hence, it is said, "Tell me your company, I shall tell you what you are." Your friendship influences your nature. Ratnakara became Sage Valmiki because of his association with the Saptharishis. Prahlada was the son of a demon, yet he was always in the company of noble souls. and steadiness of mind confers liberation. What is the inner significance of Devi Navaratri? People worship the Triune Goddesses Durga, Lakshmi and Saraswathi during these nine days. Who is Durga? She is the embodiment of all powers. Saraswati is the presiding deity of speech and wisdom. The Gayatri Mantra begins with "Om Bhur Bhuvah Suvah." 'Bhuh' means materialization. It represents matter which is subject to change. Bhuvah represents life principle, i.e., vibration. Savitri is the presiding deity of life principle. You must have heard the story of Savitri, who restored her dead husband back to life with the power of her devotion and surrender. Saraswati is worshipped as 'Jnana Devata' as she confers good intellect and wisdom. This is described in the Vedas as Prajnanam Brahma. Prajnana does not mean worldly knowledge. It is Constant Integrated Awareness, which is changeless and eternal. The divine mother has three names: Gayatri, Savitri and Saraswati. Gayantham Trayathe Iti Gayathri (Gayatri protects those who sing her glory). Gayatri, being the presiding deity of our senses, helps us to master the senses. Savitri, being the presiding deity of the life principle, protects our life. Saraswati bestows on us the changeless and eternal wisdom. Gayatri, Savitri and Saraswati are present in every man, but he is not able to understand and experience their presence. Consequently, he is giving room to wicked qualities and indulging in evil deeds, thereby ruining his life. His bad habits are responsible for his downfall. First of all, man has to develop good habits and transform himself. How could Savitri revive her dead husband back to life? She transformed the vibration in her into divine vibration by contemplating on God incessantly. That led to the resurrection of her husband. When you develop divine feelings, nothing is impossible for you. Any mighty task can be accomplished through pure and selfless love. Love develops divine power in you. There is nothing that love cannot conquer in this world. Sages perform penance in dense forests infested with wild animals. They do not possess any weapon for self protection. The weapon that protects them is their intense love and yearning for God. They tame the wild beasts with their power of love and transform them into docile beings. Man's character gets transformed into good or bad depending his company. Noble company bestows noble feelings and bad company gives rise to evil traits. Your speech and conduct are based on your feelings. You deserve to be called a human being only when you develop good feelings. Form alone does not constitute a human being. A true human being is one who embodies good habits, helps ever and hurts never. You should not merely be an Aakara Manava (human in form); you should become an Aachara Manava (human in practice). Speak good, see good, do good and be good. Divinity will manifest in you only when your conduct is good. God is not somewhere in a distant land; He is very much in you, with you and around you, guiding you and guarding you. Develop divine feelings and listen to the divine voice from within. Human body can be compared to the musical instrument Veena. You can enjoy the divine melody only when it is tuned to divine feelings. The divine melody will bestow bliss on you and make you forget yourself in ecstasy. On the other hand, profane feelings will give rise to discordant notes. Hence, let your thoughts, words and deeds be suffused with sacred feelings. Do not hurt others. Paropakaraya Punyaya, Papaya Parapeedanam (one attains merit by serving others and commits sin by hurting them). Hence, the Vedas teach, help ever, hurt never. The Vedas emphasize on the need to cultivate sacred feelings. In fact, the sacred feelings are within, but man has forgotten them. Human being is the repository of divine energy. Durga (goddess of energy), Lakshmi (goddess of wealth) and Saraswati (goddess of wisdom) are present in the human. Man is not poor in any sense. He is not weak or forlorn. He has all the capacity to experience divine bliss. In spite of being endowed with all powers, man is weak. This is the effect of evil company. You should not take it amiss, but the fact is that the modem system of education is ruining the lives of many. Modern education is leading to agitation instead of elevation. It is giving rise to evil qualities like anger, greed, desire, jealousy, etc. In fact, people who are unlettered have the virtues of humility, obedience, love and peace. Humility is the hallmark of education. One may acquire high qualification, but all his knowledge becomes useless if he lacks humility. (Telugu Poem) "In spite of his education and intelligence, a foolish man will not know his true Self and a mean-minded person will not give up his wicked qualities. Modern education leads only to argumentation, not to total wisdom. What is the use of acquiring worldly education if it cannot lead you to immortality? Acquire the knowledge that will confer on you immortality." True education is that which fosters truth, morality, integrity and culture. Education should develop human values in you. You should respect elders and serve your parents. People talk of friendship but we do not find true friends anywhere. Today friendship is tainted with wickedness and self interest. Shun bad company; seek good company and perform righteous deeds the whole day; discriminate between permanent and ephemeral. This is what you are supposed to do. Some people appear to be good and talk sweetly, but their minds are filled with wicked feelings. Beware of such people and keep them at a distance. It is because of such people abound that present day society is in turmoil. Prahlada was the son of a demon king, yet his thoughts were always centered on Lord Narayana. He repeated His Name always. His father and his teachers tried their best to divert him from spiritual path and infuse demonic traits in him. Once Hiranyakasipu asked Prahlada what he had learnt from his preceptors. Prahlada replied, "The teachers have taught me many things. I have learnt the principles of Dharma and Artha (righteousness and wealth) and studied sacred scriptures. In fact, I have learnt the very essence of all knowledge." Hiranyakasipu was overjoyed to hear all this. He said, "Oh son! Let me have the pleasure of listening to that great knowledge." Prahlada said, "Oh father, the Name of Hari will destroy all our sins. Of what use is one's education if one does not contemplate on Lord Hari and attain liberation?" Hiranyakasipu became furious on hearing this. He pushed him from his lap. But Prahlada was least perturbed. He continued to chant the name of Lord Narayana. Hiranyakasipu subjected him to various ordeals. He made elephants trample upon him and set poisonous snakes to bite him. Prahlada's unflinching faith in Lord Narayana protected him from all these dangers. Prahlada felt the mighty elephant to be as light as feather and the poison turned into nectar by the power of his devotion. Such things can be understood only by experience and not by mere description. Though he was young, Prahlada was firm in his resolve. Hiranyakasipu was overcome fury. He roared, "Oh madcap, you talk very high of your God, where is He?" Prahlada very calmly replied, "Father, never doubt that God is here and not there. In fact, He is present wherever you look for Him." (Telugu Poem) "If God is all pervasive, can you show Him in this pillar? ", he challenged Prahlada. "Yes, I can", came the answer. Such was Prahlada's faith and devotion. One can attain divinity only with confidence. Where there is bliss, there is God. Hiranyakasipu at once hit the pillar with a mace. Lo and behold! Lord Narasimha emerged from it. What is the inner meaning of this? The body is like a pillar. 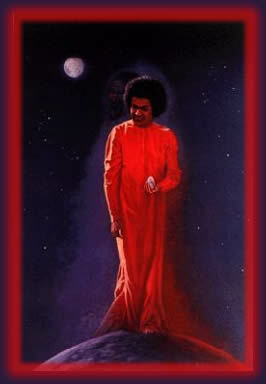 One can have the vision of Atma only when one breaks the manacles of body attachment. You can develop Atmabhimana (love for the Atma) once you give up Dehabhimana (body attachment). It is only Atmabhimana that will protect you always. Learn the language of the heart. It can be taught only by divinity and not by teachers. What you need today is unwavering faith in God. Faith alone can protect you. Under all circumstances, at all times, consider God as the basis of your life. Give up evil qualities like anger, greed, jealousy, etc. Anger can be compared to Ravana's pyre [see: Ramakatha Rasavahini]. It keeps burning always. Desire is the cause of man's downfall. Hence, eradicate desire and anger. You should manifest love and be embodiments of love. Love is God, live in love. If you have love, you can achieve anything. Hence, develop the spirit of love. Love is the most potent weapon that can win over anyone. What was the weapon that protected our ancients who lived in forests? It was not hydrogen bomb or atom bomb. It was love and love alone. So, one need not acquire atom bomb or hydrogen bomb, it is enough if one has the weapon of love. You can conquer the entire world with the power of love. People worship Durga, Lakshmi and Saraswati during these nine days. Durga destroyed the demons. As the weapons are no longer needed, people perform Ayudha Puja. When you pray to Durga wholeheartedly, she will protect you in all your endeavors. You are not able to understand the principle of divinity. Nobody in this world can help you the way God helps you. Hence, surrender yourself to God and pray for His help. Also devotion to God safeguards our ancient culture. People are haunted by misery and grief as they have forgotten God. Control your emotions. Develop love. Do not entertain evil thoughts. Nothing can confer the experience of bliss that the proximity of God gives. Love all and all will love you. Share your love with even dogs, monkeys and cats. You can see how they reciprocate your love. Man lacks the sense of gratitude that even dogs have. We see many foreigners having dogs and cats as their pets. When you love them, they too will love you in turn. Yad Bhavam Tad Bhavathi (as you think so you become). You are bound to experience the reflection, reaction and resound of your feelings, be they good or bad. If you see bad in others, it is only a reflection of your bad feelings. It is a mistake to blame others ignoring your own faults. Purify your feelings in the first instance. Love even those whom you consider as wicked. In fact, nobody is wicked in this world. It is because of bhrarna (delusion) that you consider some as good and some wicked. Develop Sathya Sankalpas (noble feelings) and follow the path of truth. Do not indulge in vain gossip. Instead, sanctify your time by chanting the Divine name. There is nothing sweeter than the Divine name. (Bhagavân sang the bhajan, "Hare Rama, Hare Rama... [MP3] "
The divine vibrations that result from the Bhajan you have just sung is spreading to all parts of the world. The divine name that you chant purifies the hearts of many. Hence, do not entertain bad feelings. Do not use bad words. Use only sacred words. Sing the glory of God. By doing so, you would have rendered a great help to the whole world. Do not hurt others. Help everybody. When you help others, you will certainly achieve positive results. Make proper use of your time. Chant God's Name and make your heart sacred. mama -- My; eva -- certainly; amsah -- fragmental particle; jîva-loke -- in the world of conditional life; jîva-bhûtah -- the conditioned living entity; sanâtanah -- eternal; manah -- with the mind; sasthâni -- the six; indriyâni -- senses; prakrti -- in material nature; sthâni -- situated; karsati -- is struggling hard. The embodied soul in its own local existence is certainly an eternal part of Me, with the mind as the sixth of the senses carried in its material position. sarvatah -- everywhere; pâni -- hands; pâdam -- legs; tat -- that; sarvatah -- everywhere; aksi -- eyes; sirah -- heads; mukham -- faces; sarvatah -- everywhere; sruti-mat -- having ears; loke -- in the world; sarvam -- everything; âvrtya -- covering; tisthati -- exists. That which has hands, legs everywhere; eyes, heads and faces all around and ears to the world, pervades everything that exists.